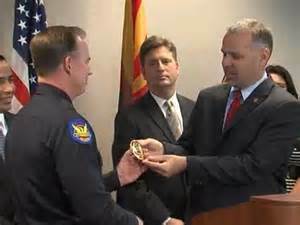 City Manager Ed Zuercher presents interim Chief Joe Yahner with his new badge at a City Hall ceremony where it was announced he will be Phoenix's next permanent Police Chief. On February 11, 2015 at a press conference held at City Hall, City Manager Ed Zuercher announced the appointment of interim Police Chief Joe Yahner to the position of Police Chief. PLEA would like to extend heartfelt congratulations to Chief Yahner as he officially takes the helm the Phoenix PD’s Police Chief. We have great confidence in Chief Yahner’s ability to move the department forward and establish positive working relations between labor and management.